Years ago, I was an architect on a top ten world-wide IT project failure. One of my many mistakes was failing to properly collect requirements. Never again. After a lot of encouragement from a great boss and caring peers, I made a commitment to learn the best practices from accomplished veterans. First best practice on-deck: use cases. With some great teams, I mastered use case writing, led requirements efforts, and now have several successful systems in production today to show for it. Mastering use case development is perhaps the best move I ever made on becoming a better architect. 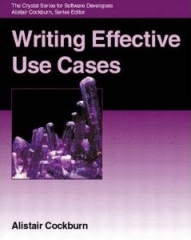 The secret: Writing Effective Use Cases (snippet) by Alistair Cockburn. Alistair is the Use Case master. His book is probably the most valuable IT book on my bookshelf. If you've ever struggled through gathering requirements, you'll appreciate its value immediately. You wont believe how many times you jump up and exclaim, "That happened to me! That is so true!" If you're a beginner, just know that this gem contains the best practices from years of actual project experience. When you follow it, you follow in the footsteps of real architects that get projects done. As beginners, on the first project where we used this book, the business consultants and I did nightly reading assignments as we composed the use cases. Within a month or so, we had a complete set of use cases that were fantastic, provided immediate value, and proved to be a key success factor throughout the life of the project. So with a little homework, your team can do it too. Lesson learned: Commit yourself to mastering the practice of use case development, and DO IT.